Widget for keeping up with the latest iTunes releases. Is there a better alternative to iTunes Buddy? Is iTunes Buddy really the best app in System category? Will iTunes Buddy work good on macOS 10.13.4? 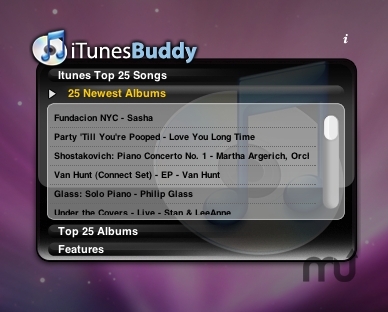 iTunes Buddy is a widget for keeping up with the latest iTunes releases. Tired of needing four or five different widgets to view the latest happenings on iTunes? So were we. So we've created the iTunes Buddy. The iTunes Buddy widget for Mac OS X allows you to stay up to date on all the newest iTunes media all in one convenient widget - with some real cool slide effects as you switch between feeds. iTunes Buddy needs a review. Be the first to review this app and get the discussion started! iTunes Buddy needs a rating. Be the first to rate this app and get the discussion started!